Make-A-Wish is one of the world’s leading children’s charities, serving children with life-threatening medical conditions in every community in the United States and its territories. With generous donors and more than 33,000 volunteers, Make-A-Wish grants a wish somewhere in the country every 34 minutes; over 285,000 since its inception in 1980. Social media platforms today provide businesses with a bevy of metrics through their native analytics. 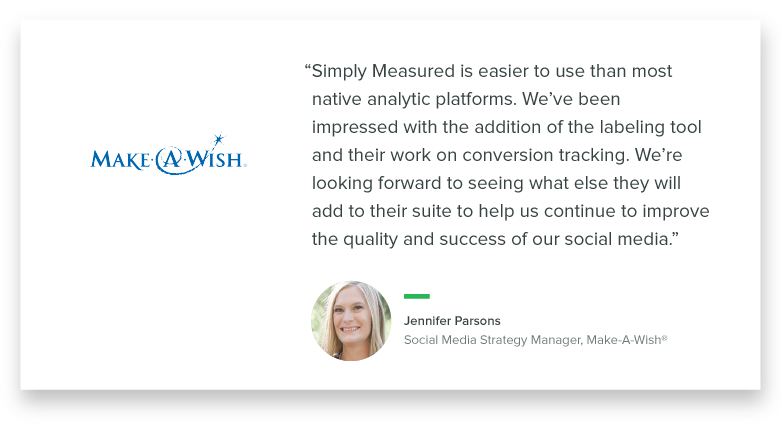 Unfortunately, those native analytics aren’t always obviously actionable—as Jennifer Parsons, Social Media Strategy Manager at Make-A-Wish, quickly realized. For Jennifer, gaining insights from native analytics meant consolidating data from multiple platforms into a spreadsheet. Manual data entry and retrieval made measuring each campaign’s impact challenging, and left her with little time to act on insights or implement improvements. 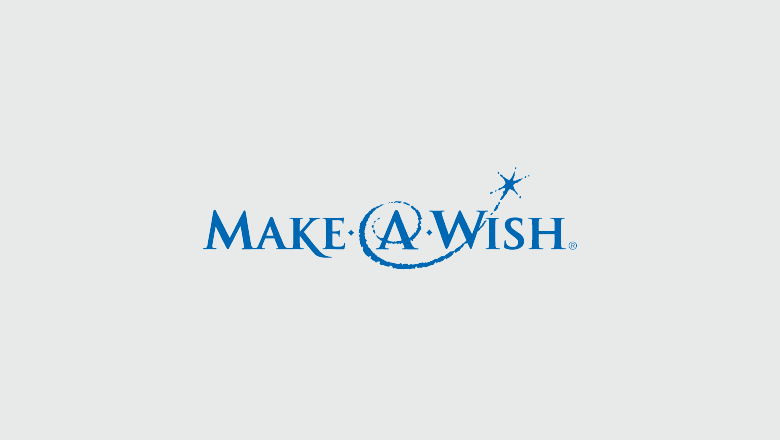 Make-A-Wish urgently needed a way to consolidate all of its key metrics into one place. Simply Measured solved this need by gathering analytics from all essential platforms and displaying them in one comprehensive report. Jennifer uses these reports to showcase progress to her colleagues at Make-A-Wish and to share campaign impact with key sponsors. Simply Measured makes it possible for Jennifer to track the traffic and conversion from all links shared on social, including her own posts, URLs shared on social networks and even URLs shared through dark social. For example, if she creates a post intended to drive referrals, she can easily measure the potential referrals acquired from these efforts. Using Conversion Tracking, Jennifer has also been able to determine that Make-A-Wish’s earned posts convert at higher levels than their owned posts, which has prompted her to try a different tack with her content strategy. With Simply Measured’s competitive tracking features, Jennifer can see when other non-profits are running campaigns and use that information to plan complementary or competing initiatives. And with concrete data at her fingertips, she can better communicate the value and success of their social media efforts to internal stakeholders. For example, Jennifer can demonstrate how, despite a competing company having three times as many followers, Make-A-Wish engages its follower base three times as effectively. Finally, Jennifer’s been using Simply Measured’s content labeling feature to easily gather and share data with her internal corporate sponsorship team. While she used to have to export all of her post data into a spreadsheet and assign each one a category code, now she can simply apply a label to her content in her dashboard. Now Jennifer can easily track shares and measure impact—and she can quickly share accurate campaign and partnership-specific reports whenever she needs to. 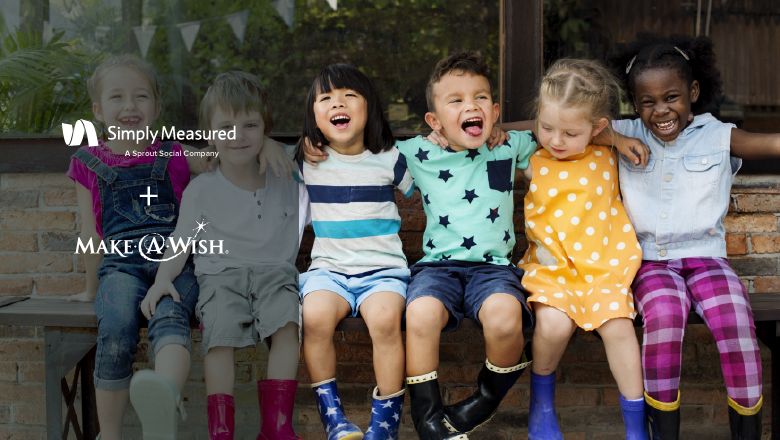 All the solutions Simply Measured has delivered over the years have had a dramatic impact on Make-A-Wish’s social campaigns, and have contributed to a 41.5% increase in social engagement year-over-year. Jennifer relies on Simply Measured daily to monitor brand health across all of their major platforms: Facebook, Twitter, Instagram, LinkedIn and YouTube. The intuitive reports are essential for discovering day-to-day performance indicators and for delivering actionable insights to her colleagues and Make-A-Wish’s sponsors.